A guide to agency pricing, what should you be charging? Cost-plus (times based) or value discussion - which one works better for your agency? When I was putting together the new agency guide to pricing digital marketing, I made a conscious effort to call it exactly that - a pricing not a costing guide. I grew up in agencies that talked about ‘cost proposals’, ‘costing projects’, ‘cost to client’ and spreadsheets that had cost against each deliverable rather than ‘price’. 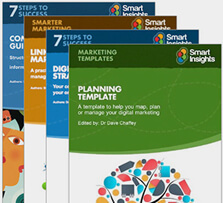 In putting the new guide together, I referred back to two existing project budget workbooks that are on Smart Insights. But I refreshed them and renamed the line items from cost to price. Why am I reinforcing point this so much? Because if you start with the idea of ‘Price’ and not ‘Cost’ (Time + Materials + a markup) you are on the way to actively thinking about how your agency makes money – by providing value to clients (and therefore earning a value-based fee). To paraphrase an article from the Ignition Group, a Van Gogh will sell for a lot more than the costs of the materials and the time it might have taken to make. Not pricing your services correctly is just one of the big mistakes your agency could be making. Our free guide to the top 10 agency errors will ensure you aren't getting in the way of your own success. Back to those workbooks: they are still time and materials based as opposed to value-based tools. They are still relevant (and helpful) as I am not yet convinced that agencies are changing en masse to a value based model. Many are still using the 100+ years old model of cost-plus (agency time + materials + external costs+ plus a markup). Google still thinks that’s the de facto approach. Okay, Google isn't thinking in that sense (well, it is more and more but that’s another subject) but if you asked an account handler in pretty much any agency ‘how does your agency charge for stuff?’ the answer back would I’m sure be ‘time’ not ‘value provided’. So, the cost-plus model is ingrained in many agencies. To have the value discussion with clients is, I think, still a relatively rare approach. But one that will be more prevalent. And one you should consider - especially for ideas, strategy and creative concepts - professional input that may not always take a lot of time but that give bags of value to the client. I could give some theoretical argument here but to give an example from my own consultancy, I have lost out when (rather stupidly) charging a client on a cost-plus basis rather than value. Here’s what happened: a couple of years back I was asked - via an agency client - to run a workshop for one of their clients, an international, premier league football team. So I duly rocked up on the day, having spent some time beforehand looking at what the club had been doing on LinkedIn, what they could be doing etc. And I spent a couple of hours leading a session with the new corporate sales and marketing guy. My pre-agreed, time-based, fee with the agency was 8 hours in total (at an agreed hourly rate). The agency was then charging on my cost (to them) + the cost of 2 account handlers in the workshop for 2 hours apiece. The client made loads of notes and at the end of the session figured out he would immediately be able to make an additional £60K in sales over the rest of the financial year by implementing what we talked about. My fee was minuscule compared to the value I delivered. As was the agency’s, who also threw in some great ideas. If ever there was an example of value versus time being a solid approach, that was it. A big lesson learned by me, and by the agency too. And it wasn’t that I was shy in talking value with the agency, it was frankly that in the ‘excitement’ of getting to support them on a new project for a big brand, I defaulted to hourly rate x hours taken. Why is this guide important to you? I didn’t have a ‘pricing council’ as it can be referred to, to stop me jumping straight into an hourly rate discussion. You can forgive me as I’m a sole consultant. But if you run an agency, ensure you talk through any proposed fees with a colleague or two before you discuss with a client. Whether that’s cost-plus time-basedd) or a value discussion. What model do you use predominantly in your agency? Have you tried a value-based approach with clients and if so, have those conversations led to a win-win for you both? I'd be interested to hear your thoughts, you can Tweet Smart Insights. How to price your marketing agency services and solutions. This guide sits alongside our pricing workbook. Together, these two guides provide you with a view on how to price your marketing agency services, with helpful and actionable advice on setting prices.